The WRAP Info Center is the place to look for answers about WRAP. What is the WRAP Info Center? It is a collection of articles, forms, media and information all arranged in a logical, searchable library. To go to the WRAP Info Center click on or . Use the powerful search function to help you find the information you want. You can search in two places: (1)The site search located on the header of each page searches the entire site – and (2) the WRAP Info Center Article Search located on the WRAP Info Center pages searches only the WRAP Info Center articles. Info Center Categories are listed in the Table of Contents. Clicking the Category will bring the full listing to the top of your screen. Some of these categories have subcategories that further define the information. Where there are subcategories, you will see a symbol in the header of the category. The subcategories can be revealed with the or collapsed with the . Beyond the searches and categories, you can navigate through the Info Center using bread crumb trails to find the information you need. You can navigate to any part of that trail by clicking on it. Click Motivation – and you will get a list of articles under the topic of Motivation. Click Info-Center – and you will return to the first page of the Info Center. At the bottom of each Article you will find a list of relevant Topics. Click any Topic to reveal a new page with a list of related Articles. The right hand column of the secondary pages of the WRAP Info Center holds some helpful tools. The Search bar is at the top and will search through all the WRAP Info Center Articles. It is powerful and can help you find what you are looking for. Popular Articles lists the top 5 articles that are being looked at by users of the WRAP Info Center. Find out what other people are looking at and what is trending in the WRAP world. 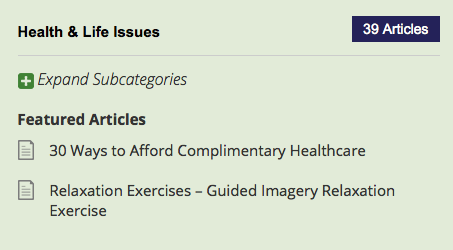 WRAP Info Topics are a graphic list of the topics in the articles. The most popular topics are highlighted in a larger, bolder font. Click on any topic and go to a list of relevant articles. Browse the WRAP Info Center articles and find out more. If you would like to join the conversation about WRAP go to . We would love to hear what you have to say and share.